With having so many new things to play with, I wasn't sure what to go for first. I'm terrible at trying to make a decision. What if I make the wrong one and I'm stuck with it? 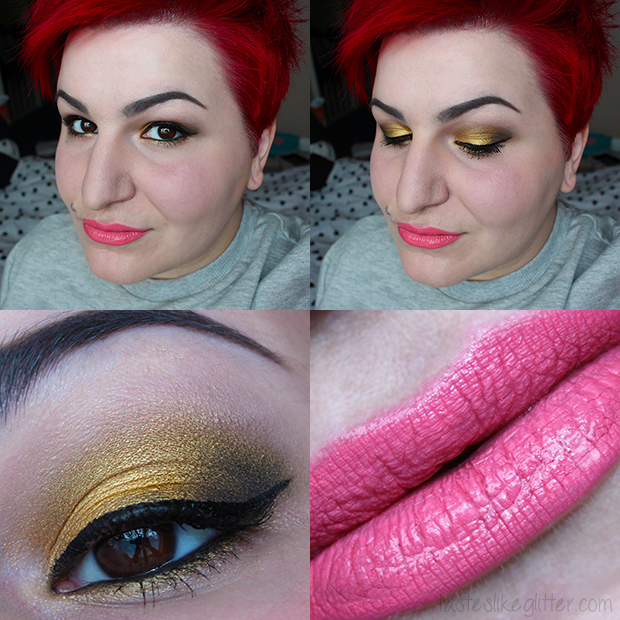 I decided to go for a golden look using Sugarpill and Inglot. Sugarpill Chromalust - Goldilux (all over lid). Inglot Eyeshadow - 433 (crease, lower lashline), 353 (brow highlight). Sugarpill Eyeshadow - Bulletproof (outer V). M.A.C Eye Kohl - Feline (waterline). I had a moment of remorse for the lip colour I'd chosen after I applied it. The MUFE Aqua Rouge, once it's on it's not going anywhere. Never mind, all things considered it could have been a worse combination. Inglot 433 is an olive green with lot of gold in it. It has a dirty, antique gold look about it and I think it looks perfect when mixed with the rich, bright tones of Goldilux. This was also my first attempt at using at Aqua Brow. Not a bad first try. Definitely one of those things that get better over time but I was the same with the HD Brow powder. It took me a while to get used to and then I had it down to a fine art. Overall I really liked how this look turned out. I can't wait to use Goldilux with other colours, it's so pretty.